Originally published under the title "Trump Says the 'I' Word -- 'Islamic' Terrorism." 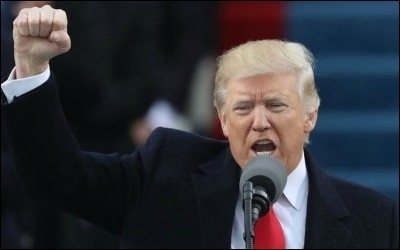 U.S. President Donald Trump pledged to "unite the civilized world against radical Islamic terrorism" and " eradicate [it] completely from the face of the earth" in his inaugural speech. English isn't my first language (Punjabi is), but when I sat down in New Delhi to listen to U.S. President Donald Trump's inaugural address, one sentence in his speech made my jaw drop. I wasn't alone. With me were a WASP Canadian, a former Wall Street Sikh banker who has taken up farming, a Columbia-educated Hindu environmental engineer and a Kashmiri pundit who is the assistant editor at India's leading newspaper. All of us looked at each other with that stare that says: "OH MY GOD! ... What did he just say?" We never expected to hear Trump's words from any leader of the Western world, expressing sentiments that are usually uttered in hush-hush tones. Trump said: "We will reinforce old alliances and form new ones and unite the civilized world against radical Islamic terrorism, which we will eradicate completely from the face of the earth." For eight years, Barack Obama tip-toed around the radical Islamist elephant in the room. Wow! After eight years of listening to Barack Obama and the rest of the world tip-toe around the elephant in the room, Trump had uttered the words "radical Islamic terrorism" on live television, in his first speech to the nation and the world as president. Until that moment, Obama (and Hillary Clinton) had bent over backward to make sure Islamists inside and outside our borders wouldn't get upset and unleash new terrorist attacks (which they did anyway). Someone had just spoken the words that hundreds of millions of ordinary Joes, Ayeshas, Vijays, Aarons and Gurmeets had yearned to hear from their leaders for years. And Trump did it, just like that. After 40 years in journalism, both in print and broadcasting, I thought these words were front-page news. But perhaps I am too old fashioned. 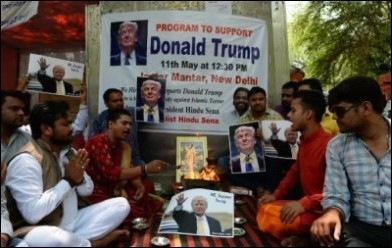 A Hindu priest performs a Hawan fire ritual on behalf of Trump in New Delhi last May. The next morning, was I in for a surprise! No Western newspaper I saw, other than the Independent, had Trump's promise of eradicating "Islamic terrorism" from the face of this earth, on its front page. Not the Wall Street Journal, nor the New York Times, certainly not the Toronto Star and, unfortunately, not even my own Toronto Sun or its sister newspapers across Canada. Talking heads on TV and newspaper editorialists spent hours weaving yards of yarn discussing the number of people who attended the Trump inauguration, but on the subject of Islamic terrorism? Not one word, that I heard. No reaction was sought from rulers of Islamic countries or the mosque establishment in Europe, North America or even in India (where I am right now). The next day, Trump doubled down on what he had said. He told staffers at the CIA: "We have to get rid of ISIS. We have to get rid of ISIS. We have no choice. Radical Islamic terrorism -- and I said it yesterday -- has to be eradicated. Just off the face of the Earth. This is evil. This is evil." There is a cowardice and complicity among the media elite to downplay the threat of Islamic terrorism. In my view, there is a cowardice and complicity among the media elite, which became endemic during the Obama years, to downplay the threat of Islamic terrorism, carefully camouflaged as wisdom. These media elites tell us that anyone who dares to vote or support Brexit, or elect or support Trump, is a racist or fascist. Well, your time is up, you millionaire Marxists. Time for you to brush up on Rosa Luxembourg and Madame Mao in your libraries. Meanwhile, we will fight on your behalf when the jihadi Islamic terrorists appear. Don't worry. You are just the extra baggage, along for the ride.